Halleluja. 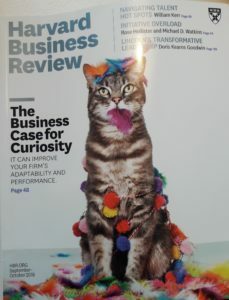 A new boost for people who believe in the relevance of curiosity for business purposes. With the summer holiday over, it is high time for educators and managers to pay serious attention to their employees (and students). My mission to convey the message on the importance of curiosity got a nice boost with the publication of results of the research of professor Francesca Gino. Curiosity is generally acknowledged to be a useful skill but in practice – when push comes to shove – fear takes over and curiosity in practice is not encouraged. The main observed barriers for managers to allow these benefits to materialise are a mis-perception of the consequences, i.e., a messy unmanageable jungle. This is often exacerbated by valuing the short term or the holy grail of certain efficiency to such an extent that anything unknown is seen too much of a risk. And now on to action? The articles gives practical and actionable advice. If you think my contribution that is fully in line with these research results can help you, feel free to get in touch to discuss this further, I’ll be happy to be your tour guide in the W-shaped Journey of Wandering & Wondering. If you want a very quick and less exciting overview, you can read the main story line here.